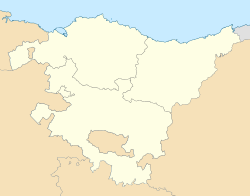 Zalla is a town and municipality located in the province of Biscay, in the Autonomous Community of the Basque Country, northern Spain, 24 kilometers to the southwest of Bilbao. The river Cadagua runs through the city. ^ "Corporación municipal". Zalla Ayuntamiento Udala (in Spanish). Retrieved 6 June 2018. Wikimedia Commons has media related to Zalla. This page was last edited on 17 June 2018, at 05:03 (UTC).